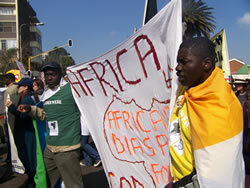 The African Diaspora Forum was created in immediate reaction to the xenophobic attacks rising in May 2008. Several community leaders and concerned residents in South Africa, called by Ivorian community leader Marc Gbaffou and Carnival organiser and pan african enthusiast Rayban Sengwayo, came together and decided to create a platform for African migrants to voice their concern and work for an integrated society. The African Diaspora Forum is a non profit organisation open to all willing individuals and organisations sharing the objectives of the Forum. Its originality consists in the union of a number of organisations representing African migrant communities living in South Africa. So far 21 African countries are represented in the Forum: Angola, Burkina Faso, Burundi, Cameroon, Congo-Brazzaville, Democratic Republic of Congo, Eritrea, Ethiopia, Ivory Coast, Malawi, Morocco, Mozambique, Nigeria, Rwanda, Senegal, Somalia, South Africa, Sudan, Uganda, Zambia, Zimbabwe. To make sure that xenophobic statements in public discourses and policies do not remain unchallenged; and to work with South African institutions (at the national, provincial and local level) to promote integration between all African communities and to dismiss those discriminatory policies that fuel xenophobia. Consisting of representatives (group or individuals) of various African communities, the Forum has specific language and cultural skills that can be used to facilitate communication as well as to organise cultural events. The forum can rely on extended networks of migrants within South African society and mobilise them for specific reasons (support to persons affected by xenophobia, organisation of pan African events of cultural or political nature, etc.). 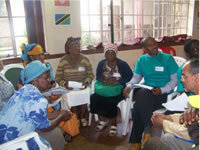 The forum has important organisation skills as many of its members are currently community leaders. The forum is open to anyone sharing the objectives mentioned above, but its specificity is its inclusion of various African communities; and its knowledge of the issues and challenges experienced at the grassroots level.